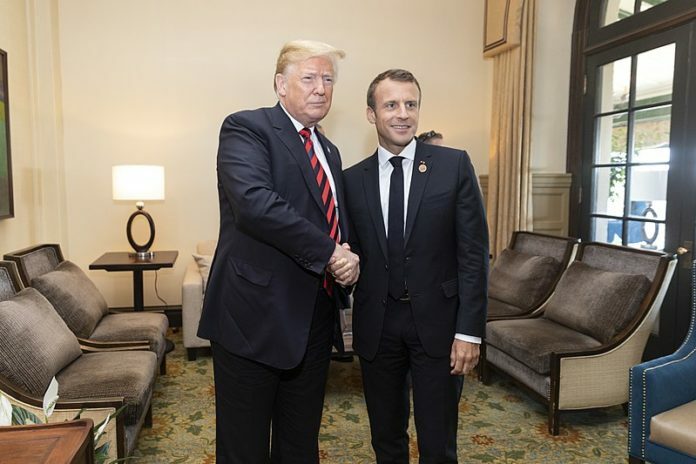 President Donald Trump continued lying on Twitter Tuesday evening by claiming that French President Emmanuel Macron agrees with his view of the Paris climate accords just because Macron suspended a fuel tax increase that resulted in riots. Protesters calling themselves “yellow vests” have been rioting in the streets for days in opposition to a planned fuel tax increase. The violence forced Macron to delay the tax for six months in an announcement made on Tuesday. It has nothing to do with the Paris climate agreement, but Trump used the announcement as an excuse to claim some kind of victory and that Macron has joined him in opposition of it. Trump also erroneously claimed to be a defender of clean air and water. First of all, Macron has not withdrawn France from the Paris accords, nor does he agree with Trump about it. In fact, the taxes didn’t have much, if anything at all, to do with it. As usual, Trump is making stuff up in order to excuse his actions. And second, Trump does not care one bit for the environment. He has loosened or killed several environmental regulations, including allowing coal waste to be dumped in streams, delayed a rule regulating toxic chemical leaks into public waterways, weakened groundwater protections, is allowing more carbon dioxide and methane emissions, among many others. Trump’s tweet follows his retweet of one of his supporters who claimed protesters are chanting ‘We want Trump’ as they riot in Paris, which has been totally debunked. Again, the protests in France have nothing to do with the Paris climate agreement, nor do they have anything to do with Trump, but he’s using the riots to sow discord and spread propaganda because he knows Macron firmly supports fighting climate change and is a champion of the Paris agreement. Trump is inciting violence and spreading disinformation, which is a disgrace to the presidency. The United States is the only nation that is not part of the climate agreement and that makes us weaker. Perhaps he thinks making everyone believe Macron has also withdrawn from the agreement will cause other leaders to side with him. But the world already knows Trump’s a liar and a conman and it did not take long for him to be fact-checked. In short, his ploy failed miserably.